"I want to apologize to my wife for the hell that she has been through," said Babchenko, who faked his death to help officials catch his would-be killers. LONDON — A Russian journalist who was widely reported to have been assassinated in the Ukrainian capital turned up at a news conference alive and well on Wednesday. 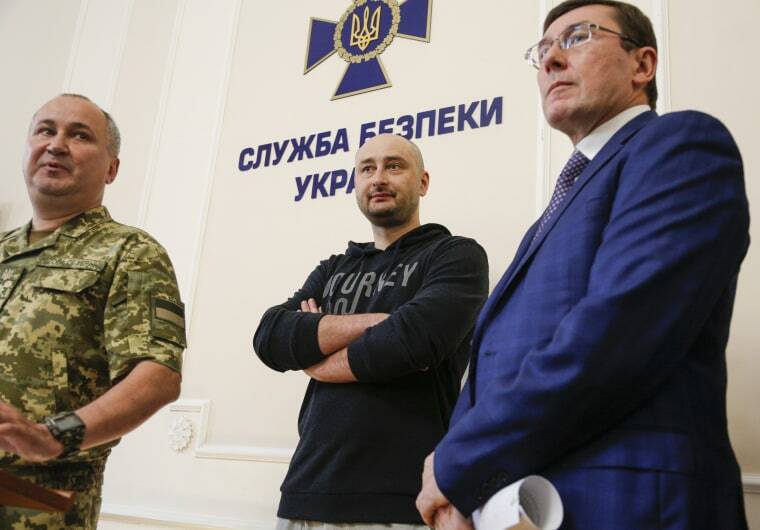 The head of Ukraine's security services, Vasyl Gritsak, told reporters in Kiev that the agency had faked Arkady Babchenko's death to catch those who were trying to kill him. Gritsak also announced that authorities had solved Babchenko's slaying. He then startled everyone there by inviting the 41-year-old reporter into the room. To the applause and gasps of the press, Babchenko took the floor and apologized to the friends and family who mourned for him and were unaware of the plan. Babchenko explained that he had been part of a Ukrainian operation to thwart a Russian attempt on his life. Gritsak said the attempted assassination of Babchenko had been ordered by the Russian security services. "I would like to apologize for what you have all had to go through," Babchenko told reporters at the conference, according to Reuters. "I'm sorry, but there was no other way of doing it. Separately, I want to apologize to my wife for the hell that she has been through," he added. The national police had previously said that the Russian journalist, who has been a harsh critic of the Kremlin, had been shot in a targeted killing. Babchenko was reportedly found by his wife bleeding at their apartment building in Kiev. Ukrainian authorities said she had called an ambulance but that Babchenko had died on the way to a hospital. Police had said he had multiple gunshot wounds to his back. Babchenko has been scathingly critical of Moscow's annexation of Crimea, the Kremlin's support for separatist insurgents in eastern Ukraine and the Russian campaign in Syria. Before it was revealed that Babchenko was in fact alive, the Russian Foreign Ministry said in a statement that "bloody crimes and total impunity have become routine" in Ukraine. Reacting to the revelation that the killing had been faked, Russian Foreign Ministry spokesperson Maria Zakharova posted on Facebook: "The fact that Babchenko is alive is the best news ... It’s obvious that a propaganda effect was part of the plan." Before becoming a journalist, Babchenko served in the Russian army and fought during the first separatist war in Chechnya during the 1990s. He later worked as a military correspondent for several Russian media outlets. Some of his articles and posts have outraged many Russians. In one, he said he felt no regret about the deaths of Russian army choir members and others from a December 2016 plane crash as they were heading to perform before Russian troops in Syria. Several Russian lawmakers even called for stripping Babchenko of his citizenship over that comment. Babchenko left Russia in February 2017, saying he was receiving threats and concerned he might be jailed. He moved to Kiev last fall. Elena Holodny, Associated Press and Reuters contributed.